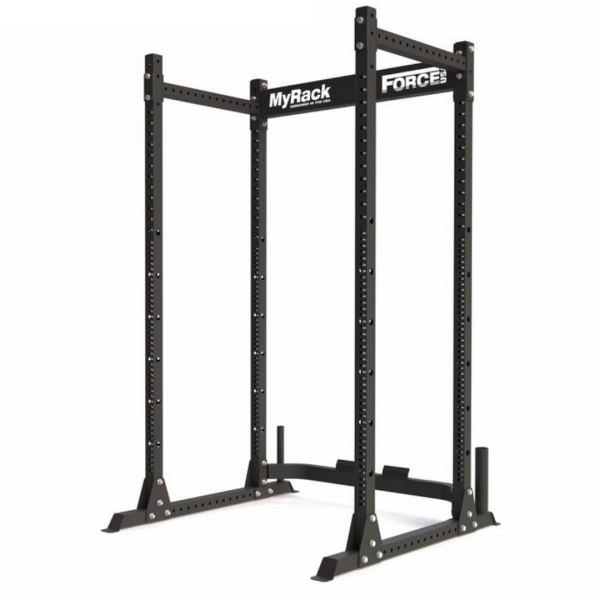 The Force USA MyRack is the first "Build Your Rack" custom power rack of its kind. Click on the red "Build Your Custom Rack" button below to start designing! Why settle for an off the shelf power rack when you can have one that is custom built just for you! 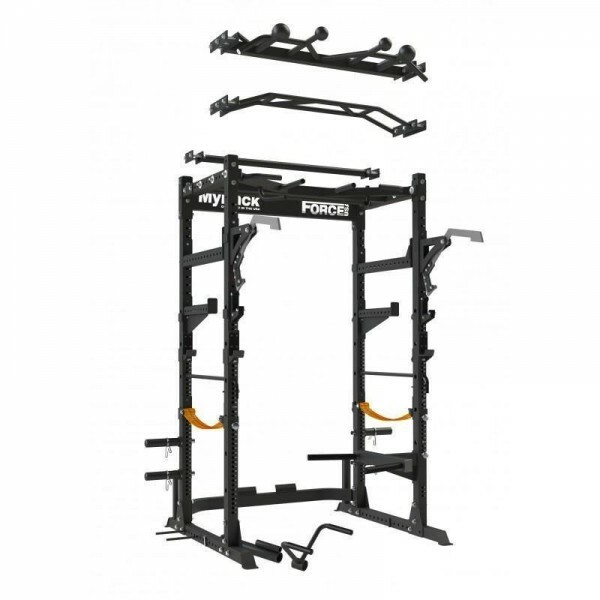 The Force USA MyRack is the most versatile power rack ever designed and can either be used freestanding or when bolted-in to the floor. Whether you train CrossFit, powerlifting, bodybuilding or anything in between, the MyRack is 100% customizable so you can take your workout to the next level. Start with the bulletproof MyRack base unit forged with precision welded, laser cut steel. Your MyRack, Your Workout, Your Choice. 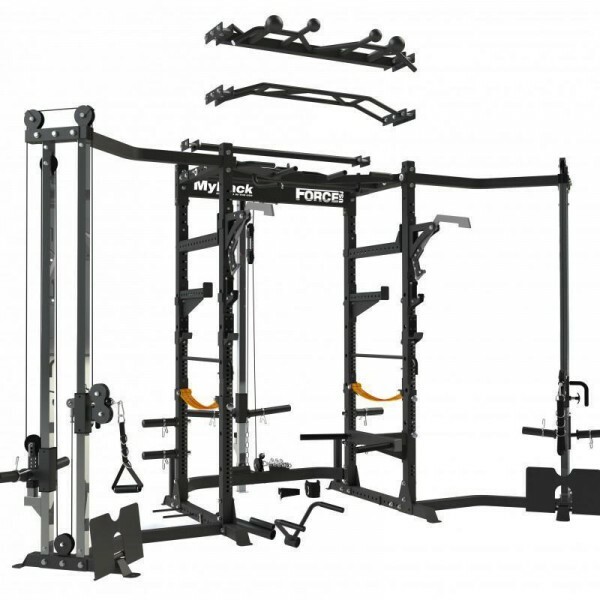 This Power Rack is a Custom Rack builder meaning YOU choose all of the attachments from the ground up. You start with this base unit and then click on each item that you would like. Of course should you need some help in making a choice, or need to know more, why not call one of our resident experts for some help? With over 20 different options to choose from and over 100 different rack variations you can create your own personalised rack to suit your specifications. 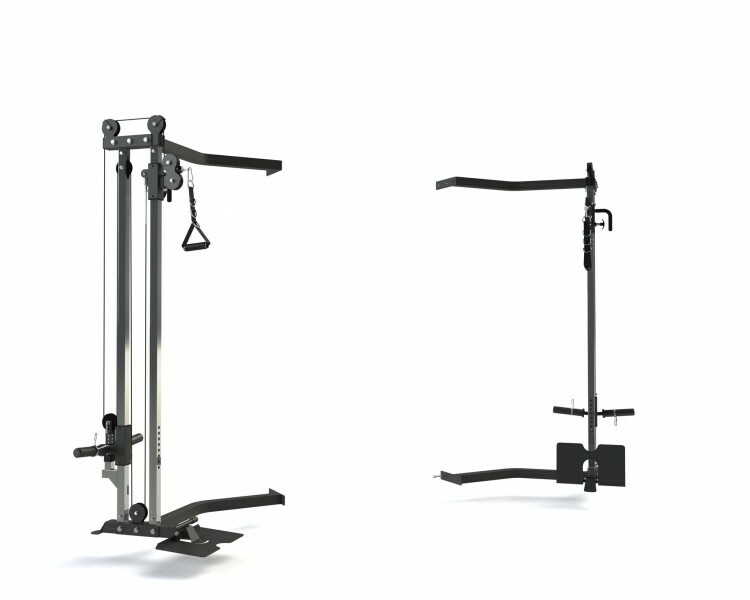 Your options are endless with an assortment of chin-up bars, J-Hooks, Safeties and Cable attachments. 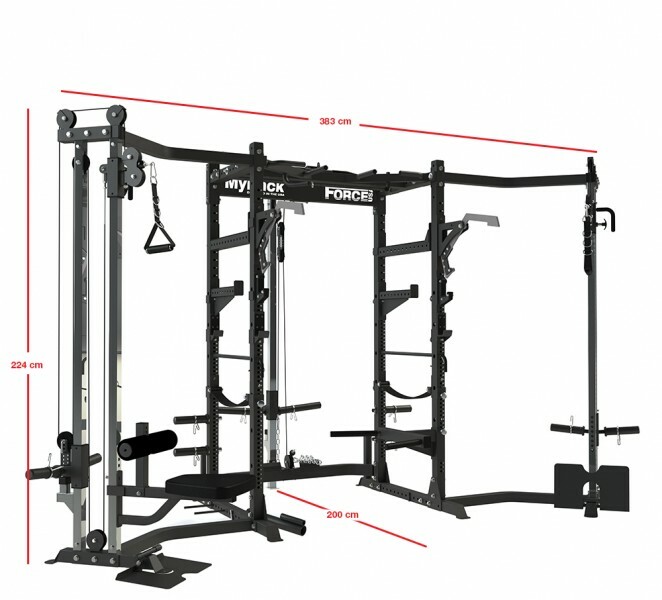 The Force USA MyRack is also the first Force USA power rack to offer a Monolift, lat pull down seat with knee holder and a globe grip chin-up bar for improving your grip strength! With safety's stronger than any weight you will be benching or squatting, so you can rest assured that you will be safe as you push out your 1RM. 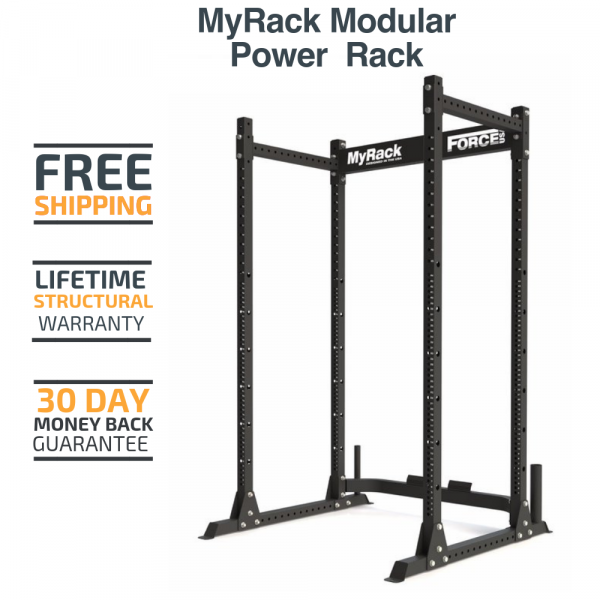 The Force USA MyRack is the only custom power rack manufactured using state or the art fully automated laser cutting and robotic welding technology. Each production run is tested to meet our rigorous safety standards and weight ratings to deliver the safest and highest quality power rack to your training facility. Used to own a Rouge system, it worked well but I was never overly impressed, setup was a hassle, and the price was pretty high. We moved and sold that system so we were in the market for something new. We started googling and landed on the MyRack page. The system looked to good to be true for the price but we took a chance and bought the my rack with both arm attachments. When it arrived I started looking over the materials and was impressed. It's all really solid and for the most part everything fits together like a glove. I set up the rack in about an hour and 1/2 by myself. Putting both arms on took about another 6 or 7 hours since I ran into some snags with the instructions (I had to use rubber mallet just little and that wasn't mentioned). My only real suggestion to make the products better is just to add a bit more clarifying direction on setting up the pulley arms. The instructions for the rack are very simple to follow but when you get to working with the pulleys it gets fuzzy in a few spots. After seeing the quality we also bought the MyBench and it is just as well made and impressive! Overall I am incredibly happy with my purchase. I've only been using it for a week and 1/2 now but so far not one issue, handles whatever weight I throw at it and everything works smoothly with little to no wobble or movement (I didn't feel the need to bolt our system to the slab in our garage). So 10/10, would do again. thought it would be fairly sturdy but when i received it, it was better than I thought. I purchased one of the chin up options and two sets of J hooks and they are all superb quality. I also didn't realise that it also came pre-installed with 2 Olympic and 2 standard bar holders which was a pleasant surprise. Also very easy to install, even by myself but recommend having someone else helping. Centre of the home gym I have had the rack for about 4 months now and couldn’t be any happier. The quality is A1, it was easy to assemble by my self and stands the test several times a week. I love that I have the option to ever expand it in many ways over time. I bought the whole set including the side cables and all the attachments. Stays solid. Very steady, very attractive, and far more affordable than Rogue. Got the bench, monolifts, cable crossovers on each side, and everything else you purchased. Now I'm using the bars with gymnastic rings. The cable cross is very sturdy, smooth moving and can be positioned in multiple levels. Best purchase ever!!! Overall I'm really happy with the rack, cable crossover, and accessories I bought with the rack. It's a bit smaller than my older rack that I bought at the local sporting goods store, but overall quality of materials and finish is better. There's still plenty of room in the rack to do barbell work and not feel cramped. Putting it together was fairly straightforward and the instructions are reasonable. The "use this piece/part" could be a bit more clear on the pulley section, but otherwise is fine. Also, it'd be nice if the instructions said "if you're going to add a cable tower, don't put this piece on yet", because you'll end up taking it off. The cross over towers are a bit wider than I'd like and leave quite a bit of free space behind them which is hard to use when you have the towers pushed against two walls. Also I was a bit worried about the plastic pulleys on the cable crossovers, but I've loaded them up pretty well for rowing with no issues. My only complaint about the cable towers was the chrome bits were coated with cosmoline or some other gunk that made the weight sled stick a bit until I cleaned it off and lubricated with a dry lubricant. Got this for my garage gym. Love it. Can build it without a bunch of extra attachments I don't need. Would def recommend. What is the weight carrying capacity of the Front safety arms on the myrack? The weight capacity is 450 kgs. We do suggest that if you are going to use heavy weights using the front safety arms that you bolt your MyRack down.